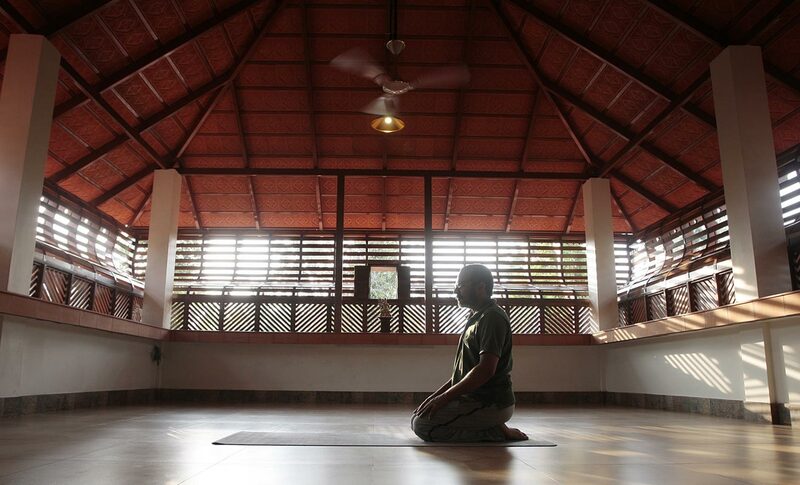 Neelambari offers an ideal setting for rejuvenation of mind and body through Yoga. Neelambari has two dedicated space for Yoga practice - an indoor Yoga hall and an outdoor Yoga space by the river. The beautiful countryside around Neelambari offers an amenable setting to turn one’s mind inward, and attain a harmonious coordination / unification of mind and body, which is what Yoga symbolifies. In addition, Neelambari can offer a range of activities that do not interfere with the pursuit of Yoga and in most cases complement the rejuvenation process. We offer excellent and authentic vegetarian fare that enhances the experience for a Yoga practitioner. Day 1 Check in to Neelambari. No specific activity is scheduled on this date. An introduction to the facility will be provided with emphasis to its traditional performance theater (Koothambalam) and series of murals done in classical Kerala style. Day 2 Morning and evening Yoga session. We will also do a village walk through the beautiful countryside around Neelambari. Day 3 Morning and evening Yoga session. All our guests have been very appreciative of the great vegetarian fare that we serve. Since the cuisine complements Yoga practice, we can spend the day indulging in some cooking sessions with simple but vegetarian dishes. Day 4 Morning and evening Yoga session. We will arrange a lecture demonstration on Koodiyattam, one of the ancient theatre forms of India with a legacy of about 2000 years and was recognized as an Intangible heritage of humanity by UNESCO. Day 5 Morning and evening Yoga session. We will also indulge in a river cruise in the beautiful Karuvannur river by Neelambari. The trip in the traditional canoe would be a refreshing experience. Day 6 Morning and evening Yoga session. On this day we will engage in some creative pursuit - a mural or pottery workshop depending on guest preferences. Both would be guided workshops by experienced artiste / craftsperson. Day 7 Morning and evening Yoga session. Neelambari has huge expanses of paddy fields in its vicinity and they provide excellent cycling trails. On this day (evening) we can go on a cycling trip along these paddy fields. In fact we can try and do the evening Yoga session by the paddy fields. Day 8 Morning and evening Yoga session. We will do a temple visit on this day. This traditional temple do not have entry restrictions for visitors to the country. We can combine this with a beach visit and once again do the evening session by the beach. Day 9 Morning and evening Yoga session. We will do a live Mohiniyattam performance in the beautiful theatre (Koothambalam) of Neelambari. We will have an introduction to this classical art form of Kerala prior to the performance and would also have some interaction with the artiste after the same. Day 10 Morning and evening Yoga session. As we are coming to the end of our Yoga retreat, an Ayurveda massage would be an ideal way to energize the body. Each session would be preceded by a one to one doctor consultation. Day 11 Morning Yoga session. Check out from Neelambari, with a fully rejuvenated mind and body. Order of experiences can be changed based on guest preferences and other considerations. Neelambari has cycles and kayaks for complementary use by guests and these can be used by guests inclined for additional activities. Cooking classes, village walk, river cruise, cycling etc are experiences fully internal to Neelambari and can be repeated if desired. We have proposed two Yoga sessions outdoor - one by the paddy field and one on the beach. If desired it is quite possible to find additional outdoor locations for Yoga sessions, that are serene and amenable.